Mild-mannered genetic engineer Strig Feleedus works for the obviously evil at first sight Dr. Muroid perfecting a formula to replace damaged genes with healthy ones. 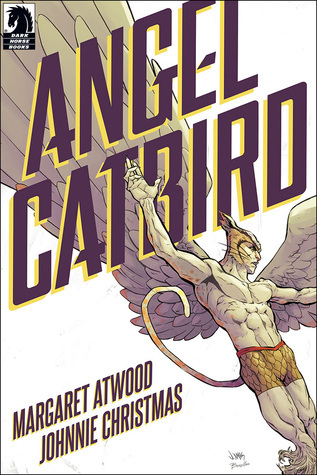 When he cracks the secret, Dr. Muroid attempts to have Strig killed but in that attempt, Strig’s genes are mixed with his cat and a passing owl; giving him the ability to transform into Angel Catbird. After this miraculous change, Strig is dropped into a hidden world of other people who can change as well. This is a fun, tongue in cheek origin story that manages to be both modern and harken back to classic Golden Age comics and all of their delicious campyness. That being said, if you don’t like multitudes of painfully obvious puns, you will not be happy reading this book. I can see how someone would get annoyed by them. While cringe-worthy, I get what the tone was going for and I ended up just smiling and shaking my head more often than not. I give this a solid 3.7 for looking great and giving me some chuckles.